Project of Doom 2015 Harry Potter Bookcase Quilt Along on Fandom in Stitches. In honor of my mother-in-law’s memory, I will be giving away one free copy of My Kitchen Window to a Sewhooked Flickr Member that shares photos of projects made from my patterns during February 2015. 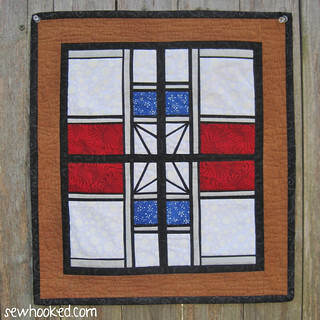 This wall hanging pattern was inspired by a stained glass piece made by Carol and gifted to my family many years ago. My patterns can be found on Craftsy, sewhooked.com, fandominstitches.com, & various Quiltmaker Magazines. Photos must be shared with the Sewhooked flickr group to be entered to win the monthly giveaway. This entry was posted in talk to me tuesday, vlog and tagged talk to me tuesday, ttmt on February 24, 2015 by Jennifer Ofenstein.